Home > Articles >What Is Going On? Life is full of unexpected twists and turns. This volatile nature of life is the test in itself. People’s realities are manifested by the way they behave when faced with the difficulties and joys of life. What makes one person more dignified or more foolish than the other is how he behaves when unanticipated events occur. What makes Muslims different from others is the advantage they have of knowing what exactly is going on—whether personally or socially; and how to behave in these situations. So how do Muslims know what is going on? Qur’an holds the answer for every situation and occasion, whether joyful or sad. 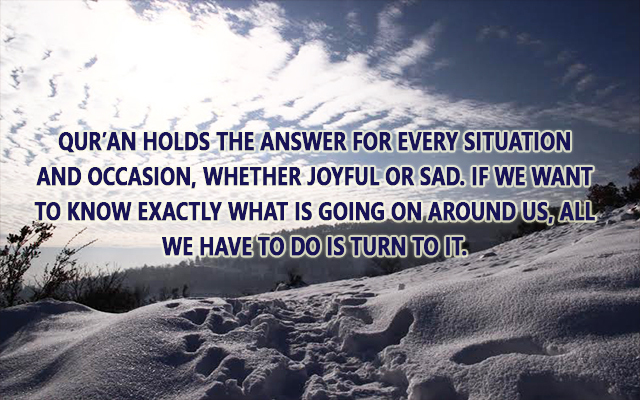 If we want to know exactly what is going on around us, all we have to do is turn to it. Qur’an was revealed over the period of twenty-three years—first thirteen years in Makkah and the last ten years in Medina. Two-thirds of the Qur’an was revealed in Makkah which mainly focused on two topics—building faith and establishing brotherhood. Whereas, one-third of the Qur’an was revealed in Medina and consisted of the verses which contain the rules and regulations of Islam. All the chapters (surah) starting with the names of the messengers and prophets were revealed approximately between the ninth and the eleventh year in Makkah. They were sent to calm Rasul Allah SAW and to inform him that what is happening to him is nothing new, because it has happened to the people before him. These surahs or chapters have messages in the beginning and messages at the end. Usually the messages at the beginning address all mankind, and the messages at the end of the surah specifically address the believers. There are many profound messages in the Qur’an and if we systematically go through them, we will understand exactly what is going on. From this point on you will be reading the words of Allah SWT with minor explanations. The more humbled you are towards Allah SWT, the more He SWT will allow you to comprehend and will clarify your understanding. Allah SWT makes it clear that there are people who are not only heedless and astray, but they deny the truth when it is presented to them! He SWT refers to their activities in life as ‘play’; a term He SWT repeats over and over again in the Qur’an. Think about these verses very carefully. Allah SWT calls Rasul Allah SAW ‘mercy to the worlds’. So when anyone gets closer to the teachings of Rasul Allah SAW and embodies them, he in fact gets closer to the mercy of Allah SWT; and the foremost teachings of Rasul Allah SAW are the way he dealt with people—his adab and akhlaq. In these verses Allah SWT has summarized the human life in its entirety from birth to death. He has given us a glimpse of different stages of life but the key reminder is of the reality of this existence, which is death. We will all die one day and will leave behind everything from this life. The message in here is clear—this life is insignificant in the eyes of Allah SWT and our time here is limited, therefore we should work diligently and relentlessly to earn Allah SWT’s pleasure instead of wasting our short time here. There are among men some who serve Allah, as it were on the verge: if good befalls them, they are therewith well content; but if a trial comes to them, they turn on their faces: they lose both this world and the Hereafter: that is loss for all to see! They call on such deities besides Allah as can neither hurt nor profit them: that is straying far indeed (from the Way)! (Perhaps) they call on one whose hurt is nearer than his profit: evil indeed is the patron, and evil is the companion (or help)! Verily Allah will admit those who believe and work righteous deeds, to Gardens beneath which rivers flow: for Allah carries out that He plans. They lose this world by being miserable and they lose the hereafter by being in the state of kufr and shirk. In this state of ingratitude and faithlessness they turn to everyone else for assistance except to the only one who is capable of helping them—Allah SWT. do not seek support from anyone except Allah SWT. If we do turn to others for support, we will be exhausted in vain and will not gain anything. It is because Allah has already ordained that anyone who turns to another besides Him SWT for support will never succeed. Whereas those who value their faith, Allah SWT has promised to be for them, to elevate them, to support them in this life, and be pleased with them in the hereafter. Note: All these verses have a common idea—warning against having any partners with Allah SWT or shirk. Many so called Muslims believe they are free from shirk but in reality it is the opposite. They are so deeply indulged in it that they are not even aware of it. This heedlessness is caused by lack of understanding, shallowness of faith, and overwhelming belief and reliance on materialistic means. Verily Allah will defend (from ill) those who believe: verily, Allah loves not any that is a traitor to faith, or show ingratitude. (They are) those who have been expelled from their homes in defiance of right,-(for no cause) except that they say, “our Lord is Allah…Did not Allah check one set of people by means of another, there would surely have been pulled down monasteries, churches, synagogues, and mosques, in which the name of Allah is commemorated in abundant measure. Allah will certainly aid those who aid his (cause);-for verily Allah is full of Strength, Exalted in Might, (able to enforce His Will). Allah SWT has promised to grant victory to those who fulfill the conditions mentioned in the verses. Note: Since Allah SWT never breaks His promise, if we are not supported by Him SWT and do not see His promises being fulfilled, meaning there is something wrong with us and our faith. And the Companions of the Madyan People; and Moses was rejected (in the same way). But I granted respite to the Unbelievers, and (only) after that did I punish them: but how (terrible) was my rejection (of them)! And for those who reject Faith and deny our Signs, there will be a humiliating Punishment. Those who leave their homes in the cause of Allah, and are then slain or die,-On them will Allah bestow verily a goodly Provision: Truly Allah is He Who bestows the best provision. Verily He will admit them to a place with which they shall be well pleased: for Allah is All-Knowing, Most Forbearing. That (is so). And if one has retaliated to no greater extent than the injury he received, and is again set upon inordinately, Allah will help him: for Allah is One that blots out (sins) and forgives (again and again). That is because Allah-He is the Reality; and those besides Him whom they invoke,-they are but vain Falsehood: verily Allah is He, Most High, Most Great. See you not that Allah sends down rain from the sky, and forthwith the earth becomes clothed with green? For Allah is He Who understands the finest mysteries, and is well-acquainted (with them). Allah SWT ends the surah with a reminder of previous nations such as Nuh, ‘Aad and Thamud and how He destroyed them. They were arrogant people who built magnificent buildings and thought that they were powerful and in control. Allah SWT destroyed them while they were in this state of disbelief; and He SWT will do the same to anyone who follows their footsteps. As a Muslim, what is the message for me? The message is that everything in this life is temporary and nothing will last forever. Whatever goes up must come down. The question is, do we have the quality and are we prepared for the time Allah SWT will bring down the oppressor? Qur’an mentions only three kinds of people—believers, disbelievers and hypocrites; there is no fourth. We all belong to one of these categories. If we read Qur’an with vision and iman, we would not need an explanation. We will know who we are. Believers have defined characteristics and they remain busy carrying out certain actions. Disbelievers also have clear characteristics and behavior patterns which they adhere to. However those who claim belief but their actions are not of the believers, they are in the worst category; they are the hypocrites who will face the most severe form of punishment wana’oodho billah. Allah SWT is referring to those whose actions do not match the state of their hearts. These are the hypocrites! Today, we claim to be people of akhirah but all our actions are for duniya…how can we explain this? Just look at the following ayah and ask yourself, isn’t that our condition today? Today we are doing exactly the opposite of what believers do. We are afraid of everything and everyone more than Allah SWT. This is shirk! Anytime we have love, fear, reliance, or gratitude for someone more than for Allah SWT is shirk. So not only do we carry hypocrisy, we also have deep rooted shirk in our hearts. That is why the most important action now is to build our iman, yaqeen and the truthfulness of Islam in us. This is the only way we will be saved from the wrath of Allah SWT! The following ayahs lay out a complete sequence of how Allah SWT gives da’wah to people. They also carry the warning of punishment which inflicts them when they reject the da’wah. people stay asleep and then the severe torture comes, from which there is no reprieve! What do you think is going on with us? Are we heeding to the message and changing our condition? 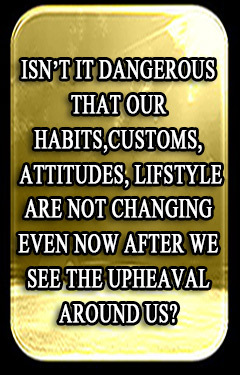 Isn’t it dangerous that our habits, customs, attitudes, lifestyle are not changing even now after we see the upheaval around us? We are in such deep heedlessness that we are not prepared to carry out any actions. We might be willing to hear, listen, and talk but not do. This defeats the purpose because it’s solely our actions which can bring the change and improve our condition. Allah SWT has a purpose and reason for everything, even tragedies. He causes tragedies in order to break our routines and to force us to think, reflect and question. Calamities force people to remember their mortality and turn to God. Shaytaan on the other hand enslaves people through routines. Once people fall in the cycle of routine they keep going until they die. This is the opposite of what Allah SWT wants. He SWT does not want from us. He SWT does not want us to have routine of duniya, instead He wants us to engage in the routine of akhirah. Majority of Muslims are stuck in their routine of duniya to the point they are not even aware of it, let alone think about breaking free from it. Unfortunately many knowledgeable people have also succumbed to this heedlessness and slavery to routine. I am anxious for Muslims, not from their enemies but from Allah SWT. If we remain heedless, situation will get tougher. Imagine if we lose our jobs, our wealth, our families, are homeless, and on top of that we have no iman and yaqeen, what will sustain us then? How will we cope with the difficulties? How will we survive? We cannot afford to be selfish and negligent any longer. It is time to take action! Have the zeal to do something for Allah SWT. Cry and ask Allah SWT to accept you. Beg Allah SWT to save you from being heedless. Beg Allah SWT for baseerah (vision). Ask Allah SWT to not let you be caught up in routine and to protect you from being enslaved to duniya. Beg Allah SWT for sincerity. Sacrifice from your income and spend regularly for da’wah. These actions have to be performed with sincerity. At this point, Allah SWT will test us to see how truthful we are. But if our time, routine, and habits remain the same, then how can we really expect Allah SWT to open for us? If we keep listening and talking but there is no real change in our hearts, it shows that we are not making enough effort! It has to be sincere effort and it has to start within us. Don’t feel disheartened or upset about negative attitudes towards Islam and Muslims. Have the zeal of spreading the message in your heart and Allah SWT will open for you. Allah SWT will unite good people to you if you are sincerely looking for them. A Japanese professor recently wrote an article encouraging people to educate themselves about Muslims since he believes there are many similarities between Islamic teachings and Japanese culture. So the efforts are being made by non-Muslims to learn about Islam. But are we ready so when they meet us they can see the teachings of Islam in us? Do we have the manners, etiquettes and the zeal to show them the accurate teachings of Islam? If we really have the quality, Allah SWT will use us! This is why all our focus has to be on building our quality. Don’t worry about anyone else. When we die, we will be asked about ourselves first. If we fail with ourselves, how can we succeed with others? The key to building quality is freedom of the soul from all attachments. This is a struggle that everyone has to undertake and it differs from person to person. Everyone’s attachments are different; some are attached to their spouses, others to their children, wealth, status, job, property etc. Whatever the attachment, it has to be released. What if I am so weak I can’t remove it from my heart? First, get physically away from your attachment, even if it is for few hours each day. Go to a secluded place, a masjid, a parking lot…whatever it takes to be alone and away from distractions. Remember Allah SWT and beg Him to remove the attachment from your heart. If you are attached to your savings, spend from it. If it is your car, sell it and get something else. If it is spouse and children, just ask Allah SWT to help you remove the attachment from your heart. If you are sincere, the second step will happen. Allah SWT will put in your heart what to do. Just so you know, this ‘to do’ will not be easy, it will be against your desire. If you do it, you will pass and Allah SWT will help you. If you fail, Allah SWT will let you go and you can cry and pray as much as you want and nothing will happen. You really want to wake up and taste the sweetness of this faith? You really want to see a dramatic change in your life for better? You really want to enjoy life as it is meant to be? Remove everything from your heart and start all over again. Do you know who does it beautifully? The New Muslims! They divorce and detach themselves from family, culture, customs, habits, lifestyle…everything for the sake of Allah SWT. They let it all go and become free from all the worldly attachments. This not only shows the courage and strength but shows how pure and sincere their dedication is towards Allah SWT. They not only transform their lives, but they also ache for others to experience the same! They are a true inspiration who should be taken as role models by all of us. 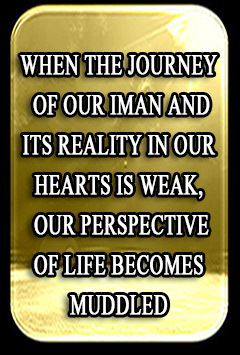 It is time for us to connect our hearts to Allah SWT and be sincere to Him. All the verses we read earlier as well as the signs around us are warning of a major catastrophe. All the odds are stacked against us. Our only option is to learn what Islam is and sincerely embrace it. At this point you might be complaining that the message is redundant and doesn’t talk about anything new. But this is how Qur’an Makki is—two-thirds of the Qur’an asks us to leave duniya and work for the akhirah. Once we are in this state we will be busy developing ourselves, being a role model for others and spreading the message of Islam. At this time we can hope to receive the support of Allah SWT both in times of ease and difficulty. And during calamities Allah SWT will InshaAllah rescue us and give us the ultimate gift which is to let us die as Muslims. 1 The signs of Allah SWT include calamities, hardships, diseases, oppression, aggression, war, natural disasters and other forms of difficulties.